The genus Berula is cosmopolitan and monotypic, with only a single species. In North America, it is found in the central and western US states, and in two Canadian provinces (Ontario and British Columbia) (USDA 2011). In BC, it is found in the Okanagan and in the Fraser Valley, where it is rare (Lomer 2011). This is a perennial, stoloniferous species of wet to moist streambanks, ditches and opens areas in lowland, steppe and montane zones in BC. 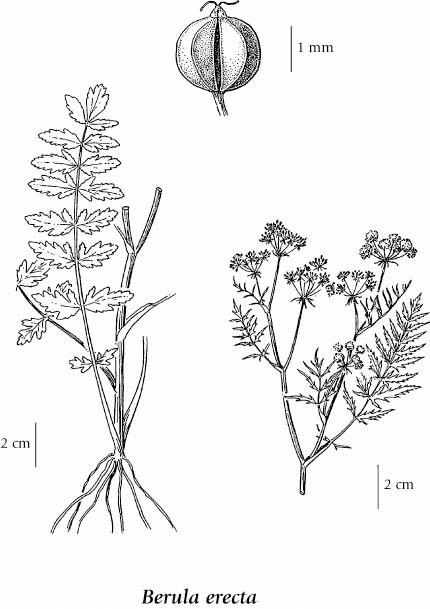 Lomer (2011) describes it in the Fraser Valley: "This semi-aquatic perennial was collected near Popkum in 1938 (UBC: Glendenning s.n.) and thought to be extinct in the Fraser Valley. It was rediscovered near Cultus Lake by Jamie Fenneman in 2008. It is abundant and dominant in a beaver dam complex on Department of National Defense land (UBC: Lomer 6756). For such a dominant population (at this site), it is surprising that it is not found elsewhere in suitable habitat. So far no other sites have been discovered, despite several searches in suitable habitat nearby, as well as west to Sumas Mt. and east to Hope." Extracted from Botanical Electronic News #432, January 2011, with permission. Perennial herb from a fibrous root, often forming stolons; stems freely branching, soft, 20-80 cm tall. 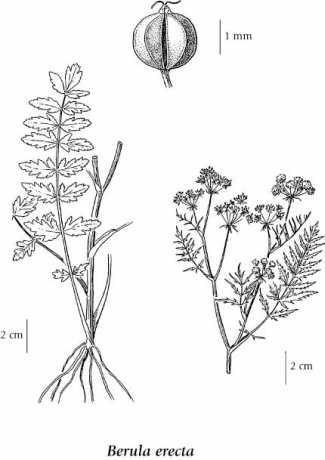 Basal leaves soon deciduous; lower stem leaves compound, oblong, scalloped with toothed edges, 6-12 cm; upper stem leaves smaller, narrower, sharply toothed and often irregularly indented; sometimes with submerged, dissected leaves. Several to many, in umbrella-like clusters; flowers small, white. Rounded, 1.5-2 mm long, ribs conspicuous. Wet to moist streambanks, ditches and opens areas in the lowland, steppe and montane zones; rare in S BC; E to NY and S to FL and MX.